The St. Clare’s Ultimate Vegetable Garden Seed Collection is the second largest vegetable garden seed collection we offer. This garden seed package is a great choice for the garden enthusiast who wants to try a large variety of veggies in their garden or for those wishing to stock up some on this vital commodity, which will be worth it’s weight in gold in times of economic downturn, but not wanting to spend as much as the cost of our St. Clare’s Stocking Up Vegetable Garden Seed Collection. Vegetable garden seeds are insurance for your family’s nutritional needs, an irreplaceable provision well worth stocking up on. Now is the time to learn all one can about gardening and seed saving, so as be prepared to provide the fresh, canned, and dried fruits and vegetables that will fill your family’s vitamin and mineral needs, when obtaining these vital provisions may no longer be as simple as a trip to the local supermarket. There is no better investment one can make to assure food for the future than vegetable garden seeds! Not only is the St. Clare’s Ultimate Vegetable Garden Seed Collection a good investment for your personal needs, but vegetable garden seeds will be a very valuable bartering commodity when food is not so readily available, and everyone is racing to plant a garden to provide the food their families need. The St. Clare’s Ultimate Vegetable Garden Seed Collection has been put together with diverse growing conditions and climates in mind, assuring that most varieties in the selection should grow well throughout the United States. With the huge selection of high-nutrient vegetables, legumes, and fruits in this collection there is sure to be something to please every member of the family, and to satisfy the passionate gardener’s desire to add variety to their garden. The St. Clare’s Ultimate Vegetable Garden Seed Collection will jam pack an extra large garden plot with delicious homegrown goodness! 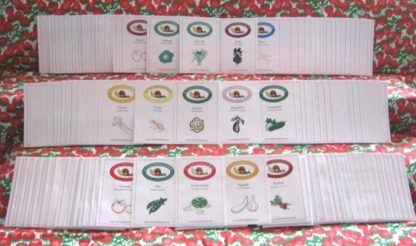 The benefits of choosing the St. Clare’s Ultimate Vegetable Garden Seed Collection are three-fold. First, all the wonderful vitamin rich heirloom and open-pollinated varieties are pure, natural, healthy food for you and your family; you know where the food came from and how it’s been grown, right there in your own backyard garden. Second, the work of choosing all these seed varieties has already been done for you, saving you time(so valuable to you and your family) and the stress of trying to decide what to grow. Third, you save at least 10 % off the cost of all that is contained in this great package, a welcome benefit in these times of economic stress! Yes, and one more way the St. Clare’s Ultimate Vegetable Garden Seed Collection can save you money, they are all open-pollinated (commonly called heirloom), able to be saved and replanted next year, always coming up as the same variety (provided plants are not allowed to cross pollinate). When you save seeds from the St. Clare’s Ultimate Vegetable Garden Seed Collection and use them next year you save all the more in your family budget. This convenient package is the “ultimate” choice for those stocking up, for the family blessed with many children, or for the person who’s crazy about gardening! Note: We reserve the right to substitute a similar vegetable garden seed variety if any listed in the St. Clare’s Ultimate Vegetable Garden Seed Collection out of stock. Thank you for your understanding!